The Block Resolution time chart shows how much time it takes for a blocker to be resolved. Blocked cards represent tasks that are problematic or challenging and need the team/team member involvement in order to be resolved and respectively unblocked. Analyzing blockers allows you to identify weak spots in your process and make improvements. The fewer items in a blocked state, the better professionals and quality. The shorter the duration of a blocker is, the better the team works together. The block resolution time chart basically shows how many times a task has been blocked, for how long and what the reason for the blocker was. If a task has been blocked more than once, the duration of the blocker is stacked so that the height of the bar shows the total time. The cards are ordered by ID from left to right. The dotted line shows the average blocked time. Click on the legend item to toggle the visibility of the average blocked timeline. 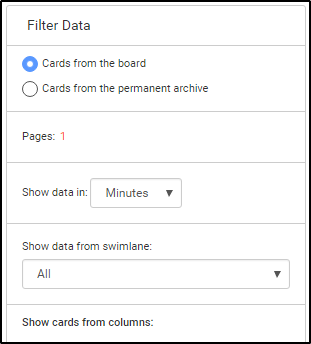 From the Filter Data panel on the left side of the graph, you can filter your data by "Cards from the board" and "Cards from the permanent Archive" and select to show your data in minutes, hours or days. You can also filter by: swimlanes and columns. Hover the mouse over a chart bar to display: the card title, block reason, block duration and date. Click on the bar representing that card to open it and view the card details. Analyzing blockers in your workflow is an effective way to identify weak spots in the process and make data-driven decisions for improvements. The Block Resolution chart supports blockers clustering. This requires standardization of the blocker reasons i.e creating a list of the most common block reasons used by the team members. The legend at the bottom of the chart displays all block reasons used in a given board and shows the duration of the blockers directly on the cards visualized in the chart plot area. Project managers can switch on/off the different block reasons and analyze the time taken into a particular blocker. Read more about the way you can block cards in Kanbanize. How to block a card?